The Rockford IceHogs would like to wish all fans a Merry Christmas and a Happy Holidays. 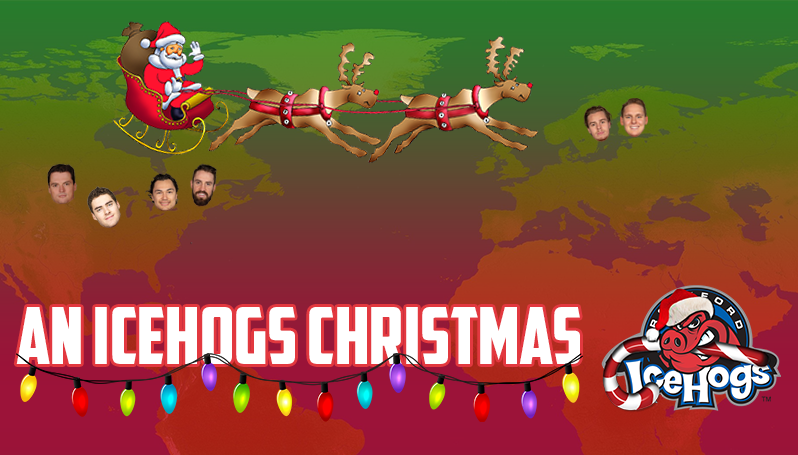 As people from around the world gather to celebrate the season in their own ways, some IceHogs players shared some of their own traditions around this time of year. Does your family/culture have any unique Christmas traditions? Sikura: We do our traditional Slovak dinner, so chicken paprikash and everything like that. Pelletier: I think just the usual stuff, not like a big family with a lot of tradition for Christmas. It was very simple, but it was always good to have the family over and spend time with the family. Lankinen: One thing that you have to do is have a Christmas sauna. So you go in the sauna at noon and then you prepare for dinner… It’s just a Finnish thing. It’s a tradition that you usually go on Christmas. Carlsson: Not really, just eating Swedish meatballs. Brookbank: When I was young, you’d wake up, Santa’s gifts would be there, then the World Junior hockey game would usually come on in the afternoon and you’d get all your new gear and play road hockey and stuff like that. It was always hockey based. What’s the best present you ever received when you were growing up? Sikura: I remember I got a drum set and my brother (Blackhawks forward Dylan Sikura) got a guitar. Those were probably the best gifts that we’ve gotten and still put them to use. Snuggerud: When I was pretty young, I got a snowboard. That was pretty cool, when I was like 10 years old. [But] I don’t know. That’s a tough question. I’ve gotten some pretty good gifts, so that’s tough. Pelletier: I guess a pair of skates… My first pair of skates was probably around four [years old]. But I really wanted a pair of skates when I was like 10 or 11, and [my parents] got me a nice pair of skates. Lankinen: I remember when I got my first set of [goalie] pads. That was probably the earliest gift I remember. That was a big day for me. I still remember, CCM Blockades, blue, silver and white color. Carlsson: Probably a hockey stick when I was younger… Bike, maybe. Brookbank : Best one I remember was I came down, and it was a Steve Yzerman jersey hanging, and then we got the original Nintendo. So we [Brookbank and his brother, former IceHogs defenseman Wade Brookbank] threw the jerseys on. I think Wade got like a Lindros, or something like that. We threw the jerseys on and just played Mario brothers. What are some of your stand-out Christmas memories? Sikura: When were kids we would just play mini-sticks until it was time to come up and eat… We used to not want to ever leave, so we would have overtimes. When it would go down to the end of the game we would just let the other team score so we could go into more overtimes and have to keep playing. Snuggerud: They’re all kind of nice. Just being home with family, getting a break from playing hockey and getting home and seeing friends and family. Pelletier: Just getting together on Christmas Eve. Then we had a big meal, obviously. Then after the meal, just [gathering] around the Christmas tree. Lankinen: Back home in Finland, we celebrate Christmas on Christmas Eve. We kind of have a big dinner, after dinner open some presents. Santa Claus is coming on the 24th, so it’s a little different but we’ll see how we do this year. Carlsson: Every year when we go skating, like the whole family. It’s very nice. Other than that, we got a nice racecar set that I spilled juice on, or something. Merry Christmas from our IceHogs family to yours!